First, let us admit that we are late risers. We often wake up so late that we miss the free breakfast at our hostel. Sometimes our blogging or Ryan’s work from the road requires him to contact people on the other side of the world at awkward times. After midnight is a normal sleeping time, and as late as 3 am is not rare. This is also the reason why we have a vast collection of sunset photos, but just 1 lonely photo of the sunrise, from 9 years ago in Mount Fuji, Japan, and that was because we didn’t sleep that night. So yeah, we’re not going to wake up at 5 am unless it’s absolutely necessary. If you are not familiar with Honduras, in short, I can tell you that while it is a wonderful place and we are having an amazing time, it’s not the safest country in the world. The homicide rate here is ranked as #2 in the world, after El Savador. The streets are full of heavily armed people. Security guards are everywhere, even inside the shopping malls. Most of them wield a pistol, but for some, the shotgun is the way to go, even for guarding a clothing stores or cinema. In the most cities walking on the street after dark is not recommended. A fellow travel blogger that had been in that city mentioned they heard gunshots during in the night, followed by wailing sirens. Last week we were in CopÃ¡n Ruinas village. A small town not far from the famous Mayan ruins of CopÃ¡n. The village is quite rustic and touristy, even though locals also live there. 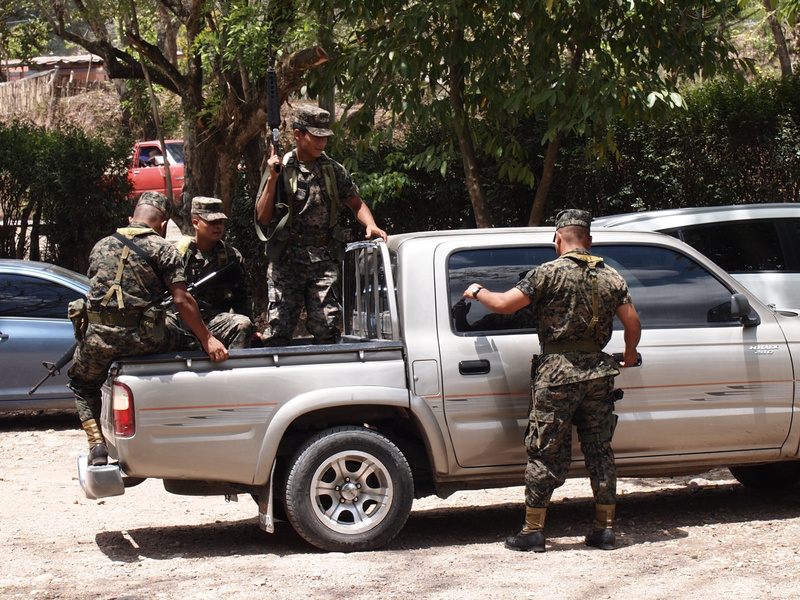 Because it’s a major tourism site of Honduras, the government pays a lot of attention to keeping the place very safe for the tourists, and indeed even though we still see armed security guards (or because of that), we felt entirely safe there. You can walk the streets comfortably, even at night. It’s a very friendly, and welcoming place. At least we thought so until we were woken up by something shocking. That was our second morning in the village. We were enjoying our beauty sleep, when a loud noise startled us. The bangs started again, and now Ryan’s eyes flew open. We were startled. Bang.. bang… We could hear the report of the explosions echoing across the valley, and though it was hard to be sure, it sounded like they were coming from the street outside our B&B. We were frightened, especially after the warnings the we’ve read about Honduras. We waited for more noises, but after a while there was no more sounds. And somehow we fell back into a fitful sleep. Later in the morning, we asked the owner of our B&B about the frightening noises. Her answer surprised us. Whew, so this is the reason for the noise in the morning. Not scary gun shots, but the start of a festival. What a way to start a special day! That was the first morning we got startled by the firecrackers. Do you remember that the B&B owner mentioned it’s a week-long fair? Well, that’s how we were woken up each morning when we were there. Only, the following mornings, we only startled for a few seconds but then remember it’s still the celebration week. In our second day, did that knowledge allow me to go back to sleep with the noises still going on? Absolutely not. It was way too loud. The announcement van was passing by our B&B, and the wake up invitation was too loud to ignore. The music was hilariously loud too. The third day though, it didn’t even wake Ryan up, he was immune to it already. Good for him! Even though this kinda annoying especially for late risers like us, we felt lucky that we experienced something that is really local and unique like this. A guy we met mentioned they also do this for birthdays in Guatemala. We wonder where else they do this. The whole of Central America, or an even wider area? Copan Ruinas is more than just a touristy village. Real local people live there and areas around it. They live here, and they don’t speak English even at the most basic level, unlike most of other touristy spots we’ve visited. We felt lucky to be in a village when the locals are having their annual celebration like this. We enjoyed the rest of the fair. Mayan style kids beauty pageant, dancing performances in the town’s plaza, the evening food bazaar around the town with super loud music, and of course the fire cracker wake up calls in the morning. Even without this, we already love Copan Ruinas for the Mayan ruins, for the local people’s friendliness, for the pretty looking village with cobblestone roads and colorful houses, for the peaceful air with armed security guards in the same time, and for the super delicious traditional food. 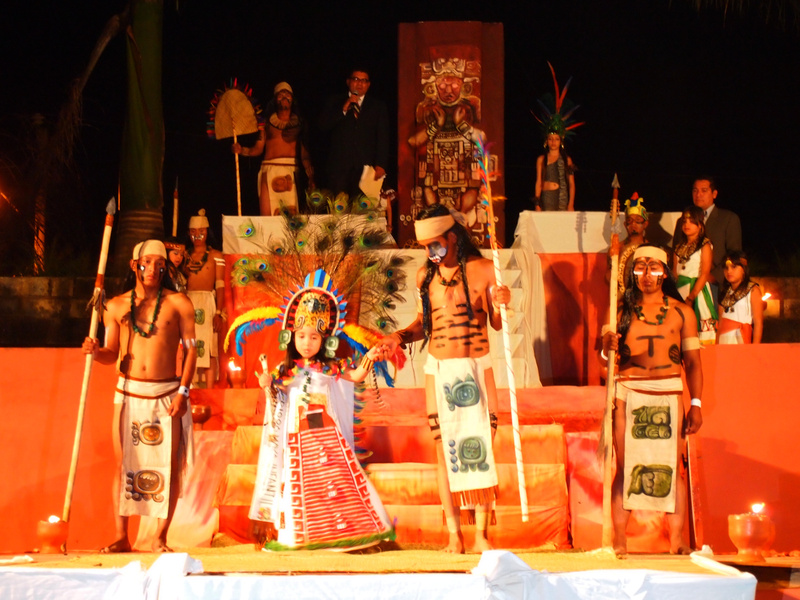 With the town fair, our Copan Ruinas experience was one of our best travelling experiences! Friendly soldier guarding CopÃ¡n Ruinas. They’re not scary after all! Have you been in Central America and experienced something like this? Ever been scared and realised later you were frightened of nothing? As for Honduras being scary, I once saw a guy on the street hiding a handgun in his waistband. But that was it. I spent 3 weeks there. While spending only one week in New York City, I saw a guy pull out a handgun and fire it into the air while walking home from a club. Murder statistics sound really scary, until you take into account that it’s all local gang & drug related. Tourists have nothing to fear! Yes, I hope one day they don’t have gang/drug related issues anymore. The locals that we met or even just passed by along the road are very nice. I just hope we will not get caught in between drug traffickers fight. Sounds like u guys are having a blast there! I think it would take me awhile to get used to seeing people walking around with guns. Btw, love the smile on that soldier dude. I think he was smitten! Ha! Smitten, eh! That’s what Ryan said too, but I think it was the picture taking, not me… My smile was super huge too because I couldn’t believe he let the photo to be taken. Previous security guard that I asked was so unhappy with my request. Well, I can definitely attest to you being night owls – that’s for sure! Look at that wee security guard – he’s shorter than you! Nothing to be scared about there, except for the big gun, maybe! Glad to know another couple of late risers! Wake up for sunset is really challenging isn’t it! Haha, too bad you spent the Christmas Day inside the hotel only =D I can imagine if you stayed right near the Parque Central, it must have been awfully loud and noisy! At least ours were stop after 6, and the B&B owners told us the story of it, haha. The louder the better, it seems like how they like it indeed. Cannon, that’s crazy! Hey, I tried to open the photo, but the link is not working somehow! Would love to see it! My eyes would have flown open too. Always nerve wracking to hear strange (and not so nice noises) when your in a strange place. As you know, firecrackers seem to be common all over SEA. I hate them. They’re also bad in Taiwan. My friends dogs go mad at Chinese New Year when they go off everyday for days. The last time you guys saw a sunrise was NINE years ago? You should stay up all night long more often, I guess Your ability to fall so easily back to sleep after having been awakened in a panic by what you thought were gunshots is hilarious. I’m in Israel right now, Jerusalem was bombed yesterday for the first time in like seven years and I’m not worried for myself at all. I think you can still have a really peaceful, nice time in countries that are experiencing strife. I’m looking forward to seeing if you and Ryan run into any more interesting episodes in Honduras. And Dina, that photo of you with the solider is great! About the fall back to sleep: well, it was so early in the morning, haha! The gunshot had stopped, so the problem must have been resolved, right? 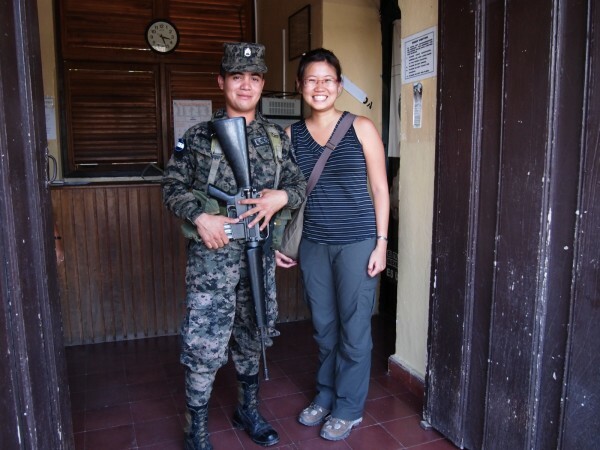 About the photo with soldier: I was super happy when he was willing to be photographed! I was rejected before in different place. I’m just glad you guys are safe! Firecrackers at 5 in the morning? Priceless! Party at 5AM? Now i’m jealous i don’t live in a place like that. Haha, very funny. 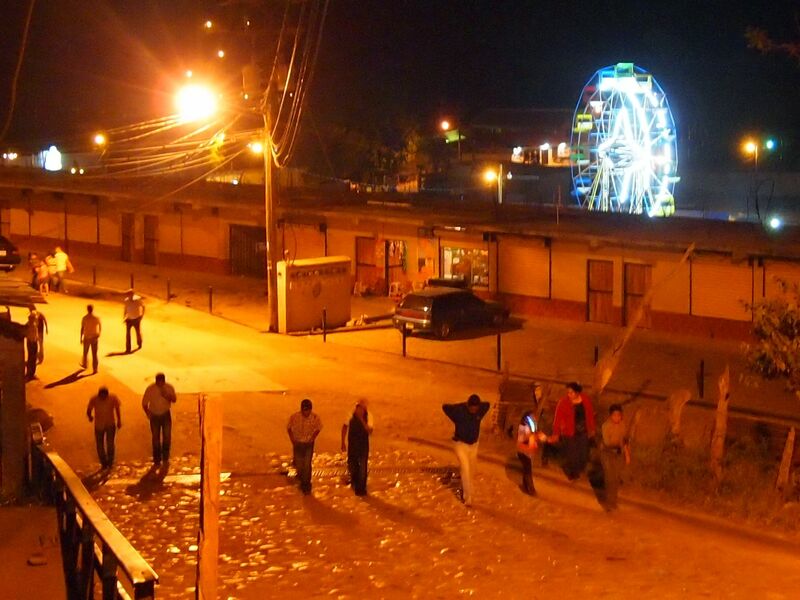 I was waiting for some street fight to have broken out, but very happy that is was just the firecrackers. I had forgotten about all the guns in Honduras. They really have more there than anywhere we have been. Even in parts of Africa. I remember always feeling safe going to the bank because hey, nobody was going to rob me with an armed guard right out front. I hate waking up early too. I don’t think I have seen a sunrise in some time as well ha. How strange that they like to be woken up early on their birthdays?! I’m glad it wasn’t gun shots though that you were hearing. Nice! In Naples, Italy, there are firecrackers and other explosions *every night* if you’re in the right area. And if you go to a place with some altitude, you can see that there are fireworks every night, too. Glad you’re safe and that it was just some good fun! If I were in your position, I think that I might have a heart attack. I do admit that I heard stories like that in my country but I never encounter one near me. I hope that it would never happen to me. Was in Copan Ruinas area the last week in April and first week in May. 2011. Had a super time…lots to do. People are very warm and friendly. Thanks to all the locals for help and info. Hope to run into some day? Sounds like you’ve got a great trip coming up. I haven’t heard of this doctor, but I hope you find what you’re looking for. I wouldn’t worry about the drive from San Pedro Sula to La Ceiba. You can take the Hedman Alas bus which is very comfortable and safe. It’s one of the nicer buses we’ve taken anywhere. Keep in mind though that San Pedro Sula is a pretty rough town, and it’s much better to arrive there during the daytime. If you are getting in late, I’d recommend having a hotel and a pickup from the airport prearranged. 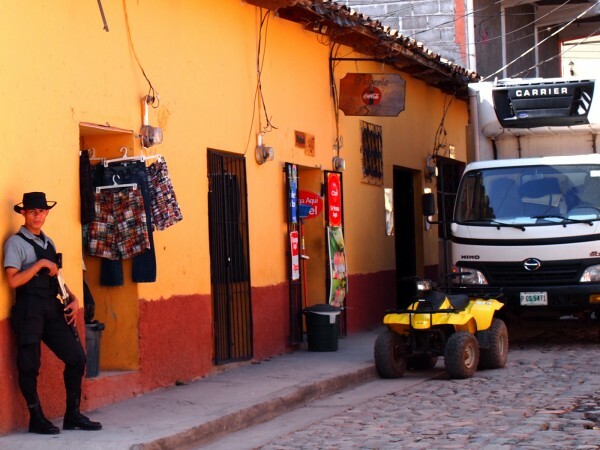 Outside of the touristy areas Honduras is a relatively dangerous place, but that just means you need to be careful. Take the necessary precautions, and please don’t let those travel warnings scare you away from one of our favourite countries to visit. And if you’re going to La Ceiba, definitely take the ferry over to Roatan at least for a few days. It’s a beautiful island and the diving there is amazing! How bizarre! I’m not sure whether I should be annoyed and excited if I know this was going to happen. Probably more on the annoying side. I hate to have a disturbed sleep!